Last Wednesday, the Daily Mail published the results of a Survation opinion poll commissioned by the right-wing tabloid itself. 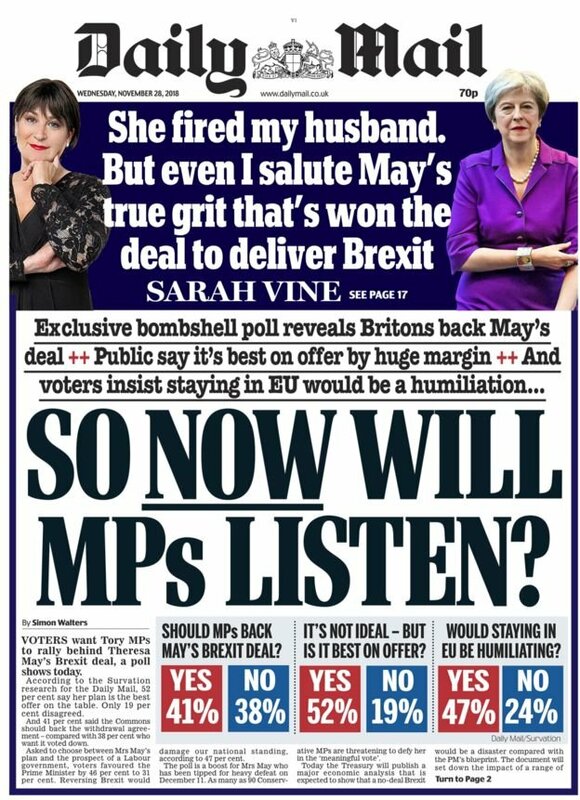 So very keen to show its absolute support for Theresa May, the Daily Mail actually twisted the poll’s result on its front page claiming voters were now backing the Prime Minister’s Brexit deal. Excuse me? The tabloid twisting facts, cherry-picking figures, making up questions and hiding true results? Has Paul Dacre returned? Indeed, the Survation poll did not quite say what the Daily Mail loudly claimed on its front page with some big, beautiful, red YESes and lovely supporting words. This, in journalism, is called misleading your readers. Wednesday’s Daily Mail front page. So, for example, according to the Daily Mail, 52% of voters think Theresa May’s Brexit deal is “the best on offer”. An absolute meaningless claim since it is the only deal on offer! But, let’s have a closer look at some of the questions asked by Survation in the opinion poll and the ACTUAL answers of the respondents. Now, that already is an interesting result. 48% of the respondents supporting a People’s Vote, leading by a margin of 14%. Who did the Daily Mail think they were kidding with a front page suggesting an “Exclusive bombshell poll reveals Britons back May’s deal”? Only 9% of the respondents strongly supporting the Government’s deal. Even by being very generous and combining that figure to the people who ‘somewhat support’ the deal, you end up with a mere 37% of ‘support’. Firstly, respondents were not overwhelmingly supporting the “For the deal” option as it only leads by a margin of 3%. Then, the fact that people would like MPs to vote for the deal does not, in any way, mean that they either like or back the deal themselves. Having been repeatedly told by Theresa May on TV, on the radio, in Parliament and through her Cabinet ministers that not voting the deal would mean crisis, instability and maybe no deal, some voters can easily feel that there is just no other choice available than her Brexit deal. When there are, in fact, many options available to exit this situation. The respondents who think that Theresa May should resign as Prime Minister lead here by a margin of 8%. It is an interesting question that shows that half of the voters do associate Theresa May very much to her deal, whether she likes it or not, whether she tells them “it’s not about me”, and think that if the deal is voted down, so the Prime Minister should go too. That should really be front page news. This shows that the voters understand the situation very well. Even though Jeremy Corbyn and his Labour frontbench think they could, under a Labour government, return to the negotiation table with the European Union and get a better deal — despite the EU officially saying no other deal is possible — most voters do understand this will not happen and the UK will not be offered any more concessions by the EU. Now, this is the bombshell, Daily Mail! In a new referendum, with the two options Remain vs May’s Deal, Remain would win. In the poll, respondents backing Remain lead by a margin of 9%. That would explain why Theresa May refuses to call a People’s Vote... at least for the moment. Or has she actually just launched her nationwide campaign to back her Brexit deal (and her TV debate with Corbyn) in order to win the Don’t-knows in the prospect of calling a second referendum after the MPs have voted her deal down? THAT should be front page news! In a Remain vs No-Deal Leave referendum, Remain would win. We here reach double-figure margin. Not interesting for the Daily Mail as it does not advance their Brexit political agenda. Shame! What do we learn here? That, in a second referendum with three options, the first choice for 44% of the respondents is for the UK to ‘Remain in the EU’. Theresa May’s ‘Brexit deal’ comes last with 22% of voters backing it in a second referendum, behind ‘Leaving with no-deal’. Remember the Daily Mail’s front page? Misleading? Inventing? Lying? Here, the Daily Mail took a huge shortcut — combining ‘Strongly agree’ + ‘Somewhat agree’ figures — to get to their 52% for the best deal on offer. Again, there is no other deal on offer, anyway! Contrary to what the Daily Mail suggested here, when asked if they would favour Theresa May’s plan over a Labour Government, the respondents said they would indeed favour the Prime Minister’s plan. Not the Prime Minister herself, as seen earlier in Question 5. Again, not great for Jeremy Corbyn and Labour either, but this is probably because Labour has not been very clear in explaining exactly how they would deal with Brexit if they were in government. Going ahead with Brexit a la Corbyn or supporting a People’s Vote a la Starmer/McDonnell? That question does not exist in the Survation poll. The question “Would staying in EU be humiliating?” that appeared on the front page of the Daily Mail last Wednesday does not appear anywhere in the actual Survation poll. The question is not whatsoever about ‘humiliation’, nor does it include the word or wording ‘humiliation’ or ‘humiliating’. 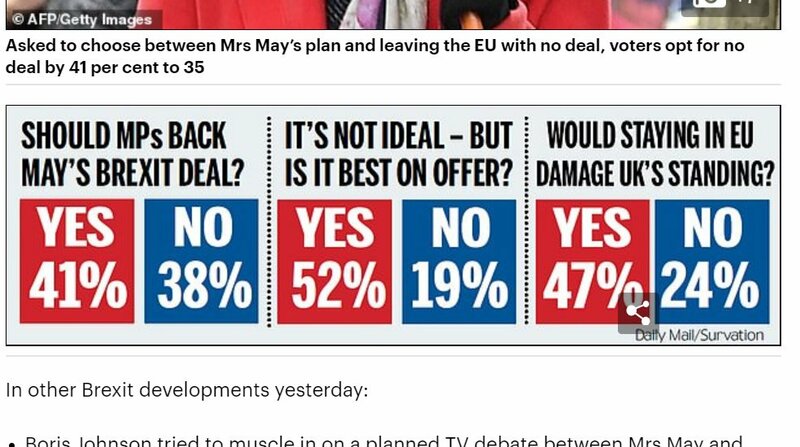 What happened here is that the team at the Daily Mail has decided to publish on their front page a very misleading interpretation of a question asked by the polling company they commissioned. Again, it is not only misleading, but it contributes to the nationalistic political agenda of Brexiteers who see the EU as nothing but an enemy who wants to ‘humiliate’ Britain. After my Twitter thread (the base for this piece) started to spread online, the Daily Mail, unable to change their printed front page for obvious reasons, published the very article with the Survation poll on their website with an edit, and... the word ‘humiliating’ had magically gone! Whenever possible British readers should be aware of the deceitful methods used by some in the Press to advance political agendas that are not in the interest of the nation and even less in the interest of the British people. The important thing to remember is that we can fact-check them. There is no such a thing as an ill-fated destiny of a society which does not hold its media accountable or its politicians accountable. Trust our journalism to fact-check them and disrupt their agendas if it is required. You can help PMP Magazine be the disruptive power. This polling showed interesting new findings about the mood of the country. There is a difference between what the public want conceptually and what they want to happen now, relative to the current political situation and this was made very clear in the article’s copy which explained the apparent contradictions accurately. In the last 2 weeks, the government’s Brexit deal had significantly more polled support among all groups of voter types than when the exact same question was asked for the paper previously and now saw more support than opposition. 52% of those polled agreed that “The Government’s Brexit agreement is not ideal but it is better than any other option available to us.” vs 19% who disagreed. Just 25% said that replacing Theresa May as Prime Minister would increase Britain’s prospects of getting a good Brexit deal. That the Daily Mail chose to feature the most interesting findings on the key question parliament faces on December 11th, would seem to be a normal editorial decision. On page 2 of the Daily Mail’s article the copy explains clearly twice, in the article and in the comment piece that the government’s deal is less popular than other conceptual options, but makes the sensible point that those alternatives are hypothetical (given that currently the December 11th tabled vote is not about any other question than this and the EU have stated that they will not be offering the UK a different deal). It will be very interesting to see, as we approach the vote if and when other polling companies ask the same question as we have - effectively “should the UK now proceed with the agreed deal or should it not?” what those figures will be. Cameron was deaf to the voters’ concerns, except for the xenophobic voters’ concerns.